The pride of CBGB’s finds his tender side. I can’t begin to explain how exciting it is to see Willie Nile in full flow on stage. In his younger days he was a regular at CBGB’s, rubbing shoulders with Blondie, The Talking Heads et all but a couple of bad record deals meant he didn’t get to make a small fortune selling Pop Records to plastic punks; instead he has toured the World more times than he can count but still retains the fire in his belly that got him standing ovations from New York’s most critical audience all those years ago. Which brings us to IF I WAS A RIVER which is a ‘solo’ album he’s talked about doing for several years; and after a successful fan-funding exercise the dream has come true. While not exactly an acoustic album; for once we find Willie at the piano surrounded by an array of highly qualified musicians from a wide spectrum and the end result is somewhere between wonderful and delicious. The title track opens the album and Willie comes across as a hybrid Bruce Springsteen – Randy Newman as he delivers a beautiful love song with such great aplomb his regular fans will be left dumbfounded. Desperately trying to keep his anger unwraps on Song of a Soldier the end result is genuinely spine-tingling and one of the shortest songs here; Gloryland carries the strongest message and stands side by side his greatest ever songs; ad there are quite a few. 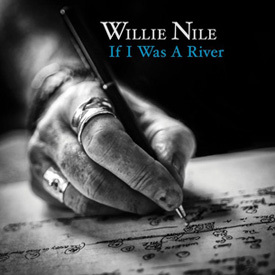 Sadly Willie’s diatribe against Popular music, Lullaby Loon may have seemed important when they were recording it; it certainly doesn’t bare repeated plays and just comes across as ‘bitter’ which I don’t think Nile is. Before I go I must tell you that the black & white cover photography (front and back) are nigh perfect for an album of this quality and would have caught my eye in a record shop.